This blog was created because of the many inquires I receive regarding grooming and to update my previous blog Grooming your Australian Terrier 101. I share with you what I have learned about grooming, over the past 5 years, and what has worked best for me. The best way to groom your Australian Terrier, is to maintain the coat and strip away the overgrown hair. The dead hair is painlessly pulled from the dog's skin, providing a place for their new hair growth to keep their coat hardened. Your Australian Terrier needs a bath only 3-4 times a year, or if he is exceptionally dirty. He should be brushed every week. A pin brush for the body, bristle brush for the face. Always, strip in the direction of the hairs natural growth, never against. Brush your dog and remove any knots, pay close attention to the under arm area, the fine longer hair tends to get snarled in that area. If you are using your fingers, brush the top coat forward, just a bit to see the longer hairs standing up. Pull those longer hairs in the direction of the hair growth or toward the tail. Repeat over the entire top and sides of the dog. If using a stripping knife of stone, place it in your hand similar to a way you might peel an apple. Keep the knife level, don't angle it toward their skin. Comb over the top hair grasping the longer hair between the comb and your thumb and pull again, in the direction of the hair growth, or toward the tail. Do not go deep into the undercoat. If you have a bulky undercoat, you can simply comb down into the undercoat with the stripping knife to remove some of the bulk. The feathery hair around his feet should be trimmed, and his tail and ears neatened. Until you are comfortable with using scissors around their ears, use a small dog electric shaver for their ears. Shave around the shape of the ears and shave the entire back of the ear in the direction of the hair growth, not against it. It’s not correct for showing, however, it is easy and safe if you are new to grooming and in 2 weeks, you achieve the look you want. I strip the hair on the back of their ear and use a stripping stone to smooth out the back of the ear. Make these sessions, short and happy, and do a little at a time. Eyes should be cleaned. Check that the nails are not too long, if you do not like to trim nails your vet will be happy to do it for you. Check that his ears are clean (don’t use q-tips) and also under his tail. Your breeder should give you a demonstration of show presentation if you require it. This is best done by practical demonstration, although looking at photos can help. Should be brushed forward to stand upright, but not hang in their eyes. Brush forward and outwards. Ruff should not be cut. Brushed down and encouraged to grow. stomach and arm pit areas. 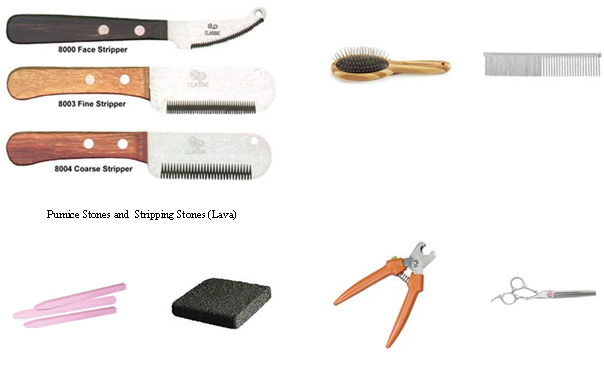 Neck: Brush and groom so that the neck appears long and arched. Remove all long hairs from tail, both around the tail and behind it. So that the tail appears natural, straight and set on high. Thinning scissors may be used to reduce the bulk of the tail. case of males, around the prepuce. look out at elbows. Sometimes it may be necessary to thin hair slightly. Muzzle: Should be free from long hair. shape of the muzzle, but not too severely. What is rolling a coat? Rolling is removing the old layers of coat to make room for new growth. You can strip off the longest hair. This is done by pulling only about the longest third of the coat, leaving the rest for a week to two weeks depending on the dog, and then repeating until there is always new coat coming in underneath. Is Knife or 'hands only' stripping better? If a stripping knife is used properly, it works as well as pulling the coat only with fingers. For some, it's easier and quicker, certainly less work on your fingers. Despite the name 'knife,' it is not used to cut the hair, only to help grip it. 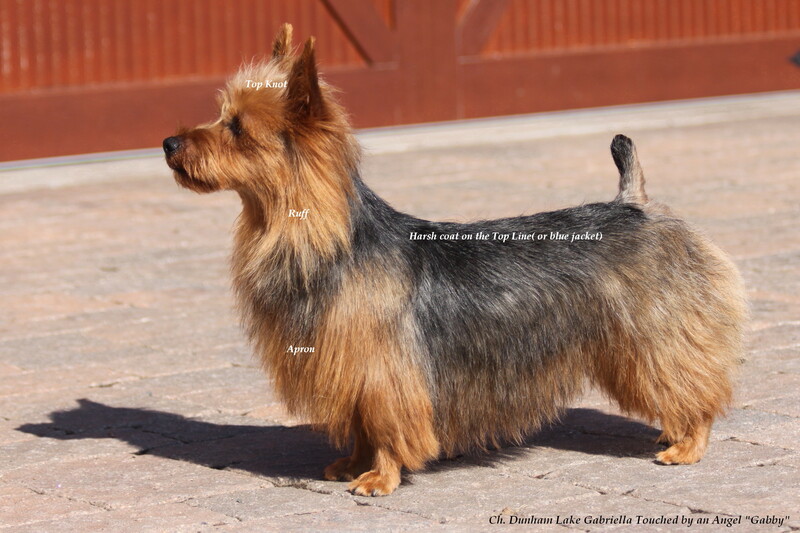 Looking at Australian Terrier photos can help you visualize the proper look. I hope this helps you. If you have other questions, please never hesitate to call or email me.